Tom Swift and his pal Bud Barclay embark on one of the greatest scientific adventures of the century -- a daring underwater crossing of the Atlantic Ocean, equipped only with Tom's electronic hydrolung suits! Hundreds of miles from land, the hydrolung batteries inexplicably go dead and the two boys are dramatically rescued in the dark of night. Examination of their equipment reveals sabotage. A complex clue leads Tom to believe there is a connection between the sabotaging of the hydrolung and the sinking of the SS Centurion--which went down in mid-Atlantic with a fortune in gold bullion and a world-famous statue aboard. After making good on their second attempt to accomplish the nonstop swim under the Atlantic, Tom and Bud are given the assignment of salvaging the Centurion's valuable cargo. To locate the sunken ship, Tom designs the aquatomic tracker, an astounding device that detects and identifies metallic and chemical traces left by an object in water, then tracks the object. How the young scientist-inventor outwits the vicious saboteurs and traps the most fiendishly clever mastermind of crime he has ever met makes a fast-moving story of super-suspense. I wrote this summary because I had to write a report on a book that I read. I thought it would be more fun if I did one on a Tom Swift book insted of a normal book. Hear it is I hope you enjoy it. 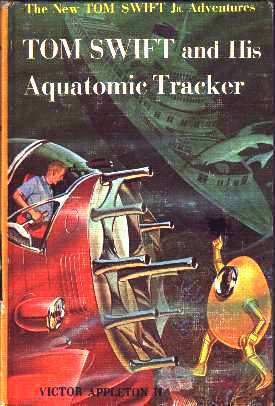 PUBLISHED IN THE YEAR 1964, TOM SWIFT AND HIS AQUATOMIC TRACKER IS AUTHORED BY VICTOR APPLETON II. THIS SCIENCE FICTION BOOK, WHICH HAS THE SUSPENSE OF A MYSTERY NOVEL, IS ABOUT TOM SWIFT Jr. AND HIS BEST FRIEND BUD BARCLAY.UNDERTAKING A DANGEROUSLY SIGNIFICANT MISSION TOM MUST SALVAGE THE GOLD BULLION OFF THE S.S. CENTURION, WHICH HAD SUNK IN THE ATLANTIC OCEAN. HE MUST WORK SPEEDILY IF THIS MISSION IS TO SUCCEED. BECAUSE TOM HAS TO FIND A SUNKENSHIP, HE DECIDES TO USE HIS INVENTION, THE BLOODHOUND OF THE DEEP, THE AQUATOMIC TRACKER. BUT, ENEMIES ARE LURKING JUST AROUND THE CORNER. AFTER ARRIVING IN ENGLAND FROM AN UNDERSEA VOYAGE, WHICH HAD HAD LIFE THREATENING MISHAPS, WHERE TOM WAS TESTING ONE OF HIS NEW INVENTIONS, THE HYDROLUNG SUIT, TOM IS ASKED TO RECOVER THE GOLD BARS OFF THE CENTURION. HUNGRILY, TOM AND SOME OF HIS FRIENDS WERE EATING AT A RESTAURANT WHEN SOMEONE TRIES TO STEAL THE BLUEPRINTS OF THE AQUATOMIC TRACKER! THE VILLAINOUS BULGARIANS SEND A HIRED MAN TO TRY AND GET TOM TO LOOK AT SIMILAR BLUEPRINTS BECAUSE THEY WANT TO SAY TOM COPIED THEIR IDEA. BUT THEIR PLANS ARE FOILED WHEN TOM DELIBERATELY REFUSES. NOT GIVING UP EASILY, THE CLEVER BULGARIANS HAVE MORE SCHEMES PLANNED. HIRED VILLAINS, STOLEN GOODS, KIDNAPPING, AND EVEN ATTEMPTS TO MURDER ARE JUST A FEW OF THE MANY THINGS IN STORE FOR TOM AND BUD AS THEY TRY TO RECOVER THE GOLD. THE RACE IS ON. WHO WILL GET TO THE BULLION FIRST? BARELY ESCAPING WITH HIS LIFE, TOM GETS AWAY, BUT BUD, STILL HELD PRISONER ON THE SHIP, FEARLESSLY WAITS FOR HIS RESCUE, WHICH MAY OR MAY NOT COME IN TIME. GOING IN TO SAVE BUD, TOM FINDS THE SHIP DESERTED AND BUD GONE! TOM KNOWING THAT HE MUST LURE IN THE VILLAINS PUTS OUT BAIT THAT THE BULGARIANS CAN'T RESIST BECAUSE OF THEIR GREED. WILL TOM SUCCEED IN LURING THE BULGARIANS IN? WILL BUD BE RESCUED ALIVE? WILL TOM BE ABLE TO FIND THE GOLD WITH THE AQUATOMIC TRACKER? HOW WILL THEY CATCH THE VILLAINS? WANT THE ANSWERS? WELL, THE ANSWERS ARE IN EVERY PAGE OF THIS THRILLER. TOM SWIFT AND HIS AQUATOMIC TRACKER PUTS YOUR STOMACH IN KNOTS BECAUSE OF THE SUSPENSE, THE EXCITEMENT, AND THE THRILL OF ENVISIONING TOM'S UNIQUE INVENTIONS AT WORK. THIS IS A STORY THAT EVERYONE HAS TO IT READ AT LEAST ONCE AND PROBABLY TWICE TO BE SATISFIED. The major invention in this book is the Aquatomic Tracker. The aquatomic tracker is, in Bud's words, a "sea bloodhound", capable of tracking a ship by the chemical residue it leaves behind in seawater. "The seacopter had been brought to an airfield hangar for the installation job. Nine long, bellflared horns projected around the nose of the craft. These, Tom explained, were his repello-spectrograph detectors, or RSG units, with built-in driftometers. "They'll sample the sea water from nine different directions around the ship," Tom said. "A computer inside, called a coincidence analyzer or CO-AN, will spot any particles of matter which show up evenly among the samples. It will also figure the direction in which to find the greatest concentration of those particles, after allowing for current drift." "ÖThe foreign particles spotted by the CO-AN will show up as flashing lights on this readout panel," Tom went on. "I'll pick out whichever ones we want to follow, and then tune in those same elements on this TC, or trail constructor." "Like saying 'Follow that taxi' to your undersea driver, eh?" Bud quipped. "Right. Now those orders are fed to a compound trace synthesizer or CTS. It compares them with the signals it's receiving from CO-AN -- and figures out what course must be steered to keep the two sets of data matched up." "And the CTS outputs to the scopes? Hank asked. "Yes, they're our visual guides if we want to steer manually," Tom replied. "On this first scope, a luminous dotted line will show the compass course of the object we're tracking. This second scope is a depth chart, to show its upward or downward course. And a dot will center on this cross-hair scope if we steer on the beam. "How about those two marker arrows on the driftometer output dial?" Arv put in. "We align them to compensate for any current." How does the computer analyze water samples? From what I could tell, Tom uses a repelatron (see Tom Swift and his Deep-Sea Hydrodome for information on repelatrons) to separate the sample into its basic elements. How feasible is it to build an Aquatomic Tracker? In theory it works out quite well, but when you get down to technical details it can quickly prove impractical. I mean, think about it: you would have to design a system that can, in real time, analyze a water sample, compare it to what you are tracking, and adjust your course to follow what you want. It would be possible, maybe, but enormously difficult. Still, there are no physical laws that prevent a Tracker from being built. Physicists can, after all, extensively analyze samples of just about anything and tell you what they're made of. They can even notice some particles down to a part per billion, and in some cases a part per trillion. The trick, then, is not analyzing the sample -- it's analyzing the sample instantaneously, getting the data together, analyzing it, and making a judgment based on the data. Can it be done? Possibly, if there was a demand for it. The firs few prototypes would undoubtedly be primitive, but as time went on the technology would improve. The real problem here, however, is in the why of the matter. Why build one? Until this question is answered, I find it doubtful that a Tracker will ever be built. How much impact would an Aquatomic Tracker have on civilization? Not a whole lot, really. Salvage operators, of course, could probably use one to track and salvage ships that have sank, and the military might want a few to track enemy subs as well (after all, it could even find subs impervious to radar). Scientists who study the ocean could probably put a few to use in tracking mineral concentrations in the Pacific, or maybe for charting gulf streams. Fishermen might even be able to use them to track the migration routes of fish. Outside of that, though, I can't think of anything. Anyone have any ideas I might have missed?